Stretching along the Mediterranean Sea from Sorrento to Positano, the Amalfi coast is one of the most famous and hard-to-reach seaside destinations in Italy. Isolated from the mainland by the Lattari Mountain range, this unforgettable coast is accessible by land on one road along jagged cliffs that plunge 3,000 feet into the sea. Such inaccessibility has made the secluded towns along the Amalfi coast truly unique centers of Italian culture. 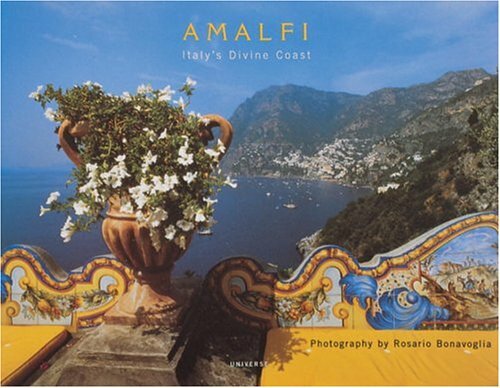 With this colorful book, photogarpher Rosario Bonavoglia takes you on an adventurous ride, through the winding passags and ravines above the seacoast, to ten different towns--including Positano and Ravello as well as lesser-known Vietri and Cetara. On this journey, Bonavoglia unveils the hidden treasures accessible only to natives of the area. His photographs capture breathtaking views of the seacoast, regional charm, and local architectural wonders, while renowned art historian Assunta Cuozzo recounts the history and the details tha make these towns so remarkable. Rosario Bonavoglia is a well known Italian photographer, a native of Salemo, and an expert on the region. His photographs have been exhibited in Japan and published in major magazines throughout Europe. He has recently published Rhythm and Colors of Manhattan. Assunta Cuozzo is a distinguished professor of art history at the University of Ca' Foscari in Venice.